Rose and George White, the owners of Morningside Florist, have always had a vision of a floral shop serving businesses and individuals in Rancho Cordova and throughout the greater Sacramento region. Morningside and its expert staff have been serving our customers for 30 years. As a leading florist in the Sacramento area, Morningside Florist provides top quality flowers, floral arrangements, and delightful gifts for all special occasions. From anniversary flowers to Mother's Day flowers to get-well flowers to sympathy flowers - all available for business, residential, hospital, and funeral delivery. This December Morningside will be celebrating our 30th anniversary doing business in the same location on Sun Center Drive in the Rancho Cordova business park. We started from scratch. On our first day, we did $50.00 in sales. We plugged along cold-calling every business along the Hwy. 50 corridor from Watt Ave. to Blue Ravine Road in Folsom. We’ve come a long way. When we started the business, our focus was on serving the companies in the business park. We quickly realized that the employees of those businesses could also use our services. We immediately expanded into wedding, funeral, special occasion, and every-day arrangements. Our creative design staff wanted to go beyond traditional bouquets, so we decided to do more unique designs, what we call our ‘Morningside style’. We take traditional seasonal flowers and mix them with exotics and interesting greens and apply our unique design skills to make one-of-a-kind floral arrangements. We combine unique combinations of flowers and make them look great together. We have worked very hard to merge technology with our flower shop. 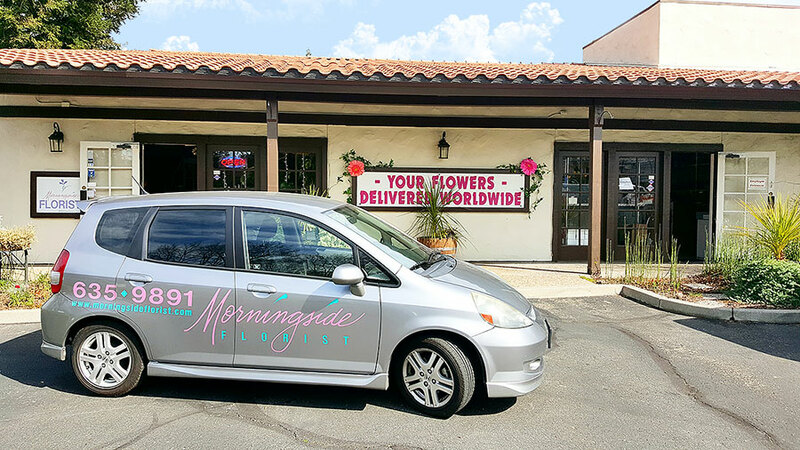 Our order entry process is completely automated, whether you call in (916-635-9891), walk in, or order online on our web site, www.morningsideflorist.com. We use Facebook, Yelp, Pinterest, Instagram, and Twitter; online marketing and social media tools. We are very tuned in with today’s trends as well as today’s brides. Most brides want to meet our designer before they come to our shop. With our strong social media presence, people feel like they know us before they come shopping. " Serving the Greater Sacramento area for 30 years! Same day delivery to Sacramento and surrounding areas. We can also deliver your flowers World-Wide. We are a creative and unique florist. Call 916-635-9891 or visit our shop.